I am still playing Town of Salem, and I have begun to suspect that issues I was complaining about may be with the game rather than the players. People do quit at all times for all reasons or none at all, but connection issues I periodically see suggest players are being awarded losses for disconnects outside their reasonable control. In the picture to the left, it is possible that half the players in the game decided to quit in the first minute before anything happened, but it seems more likely that it was a connection problem. In the same night I saw a game with 5 disconnects from initial load to first night, and then another game was won by what should have been the losing team after the mafia killing role disconnected but their departure was never recognized by the server (someone else grouped with them confirmed their Steam disconnected for 10 minutes with the character still in-game). To set the tableau for that last game, there were three mafia members against one townie. That last townie was the Mayor, who gets 3 votes and could therefore lynch a mafia member every day. 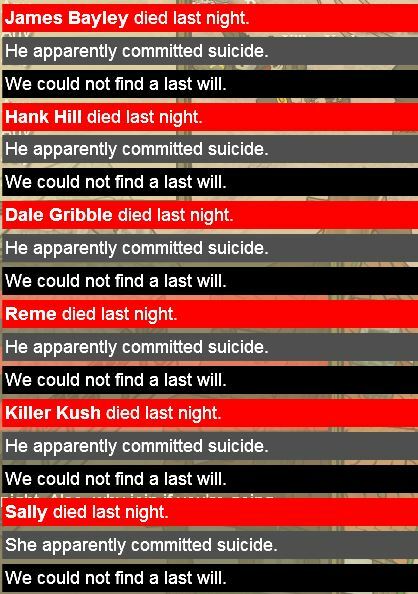 The mafia gets one kill per night, so you can see how they are not going to lose this … except that only one person has the “kill” button at a time, and that was the person who disconnected and happened to be the last person the Mayor chose to lynch. The Mayor even recognized the absurdity of the situation (without knowing exactly what happened) and avoided lynching every day to give the person time to get back. The game stretched an extra ten minutes with only one person able to make one decision every few minutes. I have had several games with disconnected/AFK mafia killing roles, which makes a joke of the game. The game can fail to connect half the players while also failing to notice when players disconnect. This is bad. Playing dumb is a viable strategy. In multi-player competitive games, players tend to coordinate against whoever is in the lead. If you look like you are stumbling while you move into a better position, you will be ready to strike while your opponents are looking elsewhere. This can become difficult in iterative games; my tabletop group knows me to be too good a strategist to buy too much of this, but they seem not to have caught on that I will complain about crummy randomization both when I get horrible luck and when I want to distract attention from how well I am doing. In Town of Salem, I am rarely sure of who is an idiot and who is engaging in obfuscating stupidity. A standard villain strategy is to run out the clock by preventing useful discussion, because a town that cannot coordinate information cannot find the mafia. Idiot chatterboxes are more likely to be villains, but this is a F2P online game, so you have lots of idiot chatterboxes and trolls. Is this person sabotaging discussion or just legitimately useless? Say some information gets through that. Then the town starts puzzling out how to deal with it. Few players know exactly how all the roles and rules work. If you know, you might mis-apply those rules in this circumstance. If you know, you might lie about how those rules apply if the truth would get you killed. Then you have incomplete or wrong information, because other players are taking secret actions and may not mention that your logic is valid but your premises are false. Sometimes players will guess the right answer despite having invalid logic, which is aesthetically displeasing, although sometimes players do have a valid deduction but are presenting an unsound argument intentionally because telling the real reasons would get them killed. And then the original “information” might not be true, due to error or lies. Most people know at least one Raymond Smullyan puzzle of the format “one always tells the truth and one always lies.” More advanced puzzles introduce the complication that people can be wrong, so you have insane liars who always say true things because they believe false things. It is often unclear whether you are winning/losing by your own merits or are the beneficiary/victim of outrageous fortune. When I started playing Town of Salem, I wondered if the game’s roles would spoil me for normal games of Mafia/Werewolf. They certainly give me the wrong expectations. In a normal game, few to no players have special roles. The Town is working on little better than random chance until they see a few votes. The game is very different without investigative roles. Hypothesis: most of the recent posts about leavers arose from people who did not like their roles. There is one great way to eliminate all those people up front: no one gets a special ability. Those players will not show up to that game to begin with. Given my recent binging on online Mafia, I was keen on seeing Bezier Games, the Ultimate Werewolf folks. Like Town of Salem, One Night uses a variety of roles with special abilities, and the One Night variation advertises itself as no moderator, no elimination, no boring parts. It has proved popular enough to get an expansion (Daybreak) and a spinoff (One Night Ultimate Vampire). My impressions are based on game demos at Gen Con, not deep and repeated play. One Night achieves “no moderator” via app. You tell your phone/tablet which roles are in play, hit the start button, and it reads off who should open their eyes when. That works well, assuming you can operate within strict time limits. Even with strict time limits, this is a long section of the game. At least a third of the game will be spent with your eyes closed while things happen outside your control or knowledge. That seems to concatenate the boring parts, rather than eliminating them, although there is some excitement because you know that mysterious and important things are happening on the other side of your eyelids. The physical implementation of this stage is difficult, especially with a large group or short people. Playing at a con helps because there is background noise and movement. In a more intimate game, it will be difficult to avoid noticing who is reaching across the table as roles are called out. Werewolf/Mafia is not meant advantage long arms, narrow shoulders, and quiet chairs. This nighttime phase is either brilliant or horrible, but I am undecided on which. About half the roles involve changing roles. The Robber swaps roles with someone else, the Drunk swaps roles with a center card (without looking at it), the Troublemaker swaps others’ roles, and more. You not only do not know who is on your team, you do not know which team you are on. The Insomniac has the surprisingly strong power of just checking her role at the end of all that swapping. Part of me wants to say this is horrible random chaos. Part of me wants to say this brilliantly expands the daytime game of deduction to including deducing your own role, so you should expect to see someone suddenly realize she is no longer a Werewolf. A good Troublemaker can evoke that moment, and a great one can lie, get a Werewolf to reveal herself, reveal whose cards she really swapped, then convince the rest of the village to lynch the Werewolf. All in 5 minutes or less. Eliminating the nighttime elimination mechanic wonderfully eliminates the “you randomly sit out this game” effect. It also quietly changes a fundamental mechanic while keeping the fluff. Werewolf is no longer a killing role; it is now entirely a hiding and lying role. Those people who want to be Werewolf/Mafia because that is the active killing role? I wonder how long it takes them to notice that the Werewolf does not kill anyone, instead just hiding from the villagers. I have not tried One Night Ultimate Vampire. I am told that it removes the team-swapping in favor of a similar goal-changing mechanic: vampires are always vampires, but now you are in love with that mortal and need to keep him alive at all costs. fewer Town in any/all. I have not counted in games where I am not Town, but my four games as a townie today have had 6, 6, 6, and 5 Town. That is out of 15, and Town’s odds drop towards zero when Town is less than half the population. I have won as a 3-person town, but you’d be a fool to bet that way. You do not play any/all to play Town; you get all the Town roles and more consistently in the normal game, so you play any/all to see the neutral and Mafia roles that do not come up in the normal game. So this is where you play using the new scrolls. 2+ Town suicide immediately. Seeing 5 suicides per game has been common. Maybe the game’s connection has gone to heck, but I’m guessing those are people who did not get their scroll role or were otherwise playing for all the reasons noted in the previous point. Combine the two above and see that it becomes increasingly rational to immediately suicide as Town. The instant you get a green role, you suspect your odds are horrible due to low average Town population, then to drop again due to high suicide rates. You could stick around in your 2- to 4-person Town and hope for luck, or you can see which way the wind is blowing and bail. Of course, this could just be absurd luck this weekend. But if the scrolls let you raise the odds of getting non-Town roles, they pretty much finish killing any/all. ETA: I’ve also been disconnected twice this weekend after ~0 before that. If servers are in trouble with post-update downloads, that could speak to some of the suicide problem. I’ve also had an invisible game where cosmetics never loaded. Town of Salem added a referrer bonus system. It’s not a big one, but if you’ve become interested and try out the game, tell ’em Zubon sent you? Other things in the update: new Forger mafia role, new chaos mode with lots of colors and killing roles, new cosmetics. Not sold yet on the new, unnecessarily long role selection animation.